Harry Potter and the Goblet of Fire is a 2005 fantasy film directed by Mike Newell and distributed by Warner Bros. Pictures. It is based on J. K. Rowling's 2000 novel of the same name. The film, which is the fourth instalment in the Harry Potter film series, was written by Steve Kloves and produced by David Heyman. The story follows Harry's fourth year at Hogwarts as he is chosen by the Goblet of Fire to compete in the Triwizard Tournament. The film is the first of the series to receive a PG-13 certificate in the US, and a 12A in the UK, and stars Daniel Radcliffe as Harry Potter alongside Rupert Grint and Emma Watson as Harry's best friends Ron Weasley and Hermione Granger. It is the sequel to Harry Potter and the Prisoner of Azkaban and is followed by Harry Potter and the Order of the Phoenix. Filming began in early 2004. The Hogwarts scenes were shot at the Leavesden Film Studios. Five days after its release, the film had grossed over US$102 million at the North American box office, which is the third-highest first-weekend tally for a Harry Potter film behind Harry Potter and the Deathly Hallows – Part 1 and Part 2. Goblet of Fire enjoyed an immensely successful run at the box office, earning $897 million worldwide, which made it the highest-grossing film of 2005 and the eighth-highest-grossing film of all-time at that time and the sixth-highest-grossing film in the Harry Potter series. The film was nominated for the Academy Award for Best Art Direction, and won the BAFTA Award for Best Production Design. 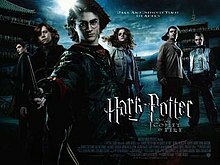 Goblet of Fire was the second film in the series to be released in IMAX. The film is one of the best reviewed instalments within the series, being praised for the higher level of maturity and sophistication of its characters, plotline, tone, screenplay, and the performances of the lead actors. Harry awakens from a nightmare wherein a man named Frank Bryce is killed after overhearing Lord Voldemort conspiring with Peter Pettigrew and another man. While Harry attends the Quidditch World Cup match between Ireland and Bulgaria with the Weasleys and Hermione, Death Eaters terrorise the camp, and the man who appeared in Harry's dream summons the Dark Mark. At Hogwarts, Albus Dumbledore introduces ex-Auror Alastor "Mad-Eye" Moody as the new Defence Against the Dark Arts teacher. He also announces that the school will host an event known as the Triwizard Tournament, in which three magical schools compete across three dangerous challenges. The Goblet of Fire selects "champions" to take part in the competition: Cedric Diggory of Hufflepuff representing Hogwarts, Viktor Krum representing the Durmstrang Institute from Eastern Europe, and Fleur Delacour representing Beauxbatons Academy of Magic from France. The Goblet then unexpectedly selects Harry as a fourth champion. Dumbledore is unable to pull the underage Harry out of the tournament, as Ministry official Barty Crouch Sr. insists that the champions are bound by a contract after being selected. For the first task, each champion must retrieve a golden egg guarded by the dragon they pick. Harry succeeds in retrieving the egg, which contains information about the second challenge. Shortly after, a formal dance event known as the Yule Ball takes place; Harry and Ron attends with Parvati and Padma Patil, Harry's crush Cho Chang attends with Cedric, and Hermione attends with Viktor, making Ron jealous. The second task involves the champions diving underwater to rescue their mates. Harry finishes third, but is promoted to second behind Cedric due to his "moral fibre", after saving Fleur's sister Gabrielle as well as Ron. Afterwards, Harry discovers the corpse of Crouch Sr. in the forest. Later, while waiting for Dumbledore in his office, Harry discovers a Pensieve, which holds Dumbledore's memories. Harry witnesses a trial in which Igor Karkaroff confesses to the Ministry of Magic names of other Death Eaters after Voldemort's defeat. When he names Severus Snape as one, Dumbledore vouches for Snape's innocence; Snape turned spy against Voldemort before the latter's downfall. After Karkaroff names Barty Crouch Jr., a devastated Crouch Sr. imprisons his son in Azkaban. Exiting the Pensieve, Harry realizes that Crouch Jr. is the man he saw in his dream. For the final task, the champions must reach the Triwizard Cup, located in a hedge maze. After Fleur and Viktor are incapacitated, Harry and Cedric reach the cup together. The two claim a draw and together grab the cup, which turns out to be a Portkey and transports them to a graveyard where Pettigrew and Voldemort are waiting. Pettigrew kills Cedric with the Killing Curse and performs a ritual that rejuvenates Voldemort, who then summons the Death Eaters. Voldemort releases Harry and challenges him to a duel to prove he is the better wizard. A vulnerable Harry tries the Expelliarmus charm to block Voldemort's attempted Killing Curse. The beams from their wands entwine and Voldemort's wand disgorges the last spells it performed. The spirits of the people he murdered are seen in the graveyard: first Cedric, then Frank Bryce, then Bertha Jorkins, and finally Harry's parents. This distracts Voldemort and his Death Eaters, allowing Harry to use the Portkey and escape with Cedric's body. Harry tells Dumbledore that Voldemort returned and killed Cedric. Moody takes Harry back to his office to interrogate him about Voldemort, but inadvertently blows his cover by asking Harry whether there were "others in the graveyard", despite Harry not mentioning a graveyard. Moody reveals that he submitted Harry's name to the Goblet of Fire and manipulated Harry throughout the tournament to ensure he would win. Moody attempts to attack Harry, but Dumbledore, Snape, and Minerva McGonagall intervene and subdue him. The teachers force Moody to drink Veritaserum, and he reveals that the real Moody is imprisoned in a magical trunk as his Polyjuice Potion wears off. He is revealed as Crouch Jr. and returned to Azkaban. Dumbledore reveals to the students that Voldemort killed Cedric, although the Ministry of Magic opposes the revelation. Later, Dumbledore visits Harry in his dormitory, apologizing to him for the dangers he endured. Harry reveals that he saw his parents in the graveyard; Dumbledore names this effect as "Priori Incantatem". Soon after Hogwarts, Durmstrang, and Beauxbatons bid farewell to each other.